All supporters will be invited to a thank you concert on completion of the stage. BE PART OF BUILDING SOMETHING GREAT… About Our Campaign It’s the jewel in Taree’s crown – the magnificent Manning River foreshore. How often do we talk about the fact we should be using it MORE? Our town shines when we are by the river. It’s the venue for the weekly Taree parkrun, the summer rowing regatta, the Easter Powerboats, New Year’s Eve fireworks and the highly successful first run of the TasteFest on the Manning food festival. We want to celebrate our river, our town and our people in a big way by building a brand new stage for the community in Queen Elizabeth Park on the Manning River foreshore. But we need your help to get there! We are asking our local politicians and council for a grant as a catalyst for making this dream a reality. Let’s show them how much the community is behind this project by contributing as well. The question really should be well, why not a stage? A stage brings boundless possibilities to our town. From watching comedy, theatre and music by the river to hosting an outdoor cinema – there is so much we can do. Sporting events coverage will be amplified on stage and schools and all sorts of community groups could utilise this fabulous, new performance space. Don’t we already have a riverbank stage? Our thinking is – why can’t we have both? 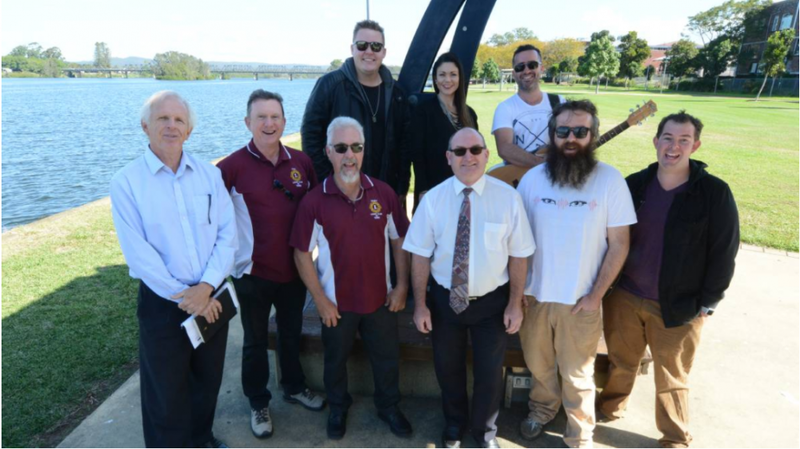 With Taree having two river stages, this could even lead to a festival stretching the entire foreshore. Now that’s big thinking! First of all there’s the happiness factor. Imagine it. You are down by the river with your family watching a great film or perhaps it’s your child’s first ever performance on stage. The weather is perfect, you’re reclining in a bean bag or arm chair. There are food stalls and you’ve just opened a delicious, fresh bag of popcorn. Maybe you’re a live music lover and your favourite band has come to town because they really want to play a riverside gig. They are about to start, you’ve picked up a picnic basket and you’re enjoying the ambience of this great location. It’s bliss. Now it’s Australia Day and you’ve come to cheer on the nominees – the sun is shining, there’s entertainment on stage and the river is offering a cool breeze. What we are trying to say is this stage will cater to everyone’s happiness through a broad range of events. Then there’s the Ka-Ching factor – the dosh, the moolah, the money. There’s no doubt that having a riverbank stage will bring immense economic benefits to our town. By having a new platform for events – the stage offers opportunities not only for performers and audiences but for surrounding businesses to tap into the economic potential. From sponsoring large events, running food stalls to offering special riverbank stage deals – the possibilities are endless for our businesses. To add to this, the stage will be a great tool in attracting visitors to the area. These visitors will stay, shop and enjoy our area. Events are big business – take these stats from the Destination NSW website. Event visitors spent around $2.3 billion in NSW in the year ending December 2016. And for regional areas? Domestic and international visitors to NSW destinations outside Sydney generated a massive 84.3 million nights of accommodation in Regional NSW and $15.0 billion in visitor (overnight and day trip) expenditure. Taree is a town where the community makes great things happen. Nearly all of our events come straight from the heart of volunteers. We couldn’t have facilities like the Manning Entertainment Centre or the Manning Aquatic Leisure Centre, if it wasn’t for the valuable contributions of people in our town. Tell a friend! Share the campaign on Facebook or even better use your mouth and get talking in the community. Let’s get the whole town talking about why we deserve a stage on the riverbank. Great video and a fantastic idea for our region! The hard work has been done in launching this concept. We would love to see as many people as possible get behind the campaign! Lets get this one done for our community. This has been a fantastic community project for MidCoast Digital to support. There are so many talented people in our region who deserve a stage – from children to grandparents. Come on #ManningValley – let’s build our stage! It has been dreamed about, discussed, researched, sketched and engineered. We now have to build it to turn that hard work into a reality. Get behind this project of the greater good of the entire Mid Coast community. Donate today! We’ve secured the grant funding ($50,000) and we are now well on the way. We still, now more than ever, need your help to raise the rest of the money to cover the budget to complete the construction of our signature structure on the magnificent Manning. Please donate here, on our crowd-funding site, to turn this project into a reality for all of our community. Every little bit helps.